I recently visited Surreal Things, a special exhibition on Surrealism by the Art Gallery of Ontario (AGO). The exhibition explores the philosophy behind Surrealism and how those ideas inspired more commercially minded designers of fashion, jewelry and other consumer goods. As I was wandering there amongst ruby lips, aphrodisiac telephones and cloud sofas, it struck me that there is something in common between the surrealist ideals and the culture of entrepreneurship that MaRS is helping to build in Ontario. The Surrealist movement came about in the mid 1920s. In the Surrealist Manifesto – Andre Breton, a leading member of the surrealist movement – describes Surrealism this way: Surrealism is based on the belief in the superior reality of certain forms of previously neglected associations, in the omnipotence of dream, in the disinterested play of thought. The ideas behind surrealism were to break with the existing system of rational thinking and reject established ways of doing things in favor blurring the boundaries of physical objects by including creative contrasts and fantastic, often dream-like ideas. At MaRS, we service hundreds of entrepreneurs every year, usually in the fields of ICT/digital media, cleantech and biotech. Much like the surrealists, the basis for a start-up is an idea that is radically new, born by a rejection of the existing way of doing things, but in our case enabled by new technology. Entrepreneurs learn quickly that all new technology faces resistance, both from the establishment in their particular field as well as lack of support from much of the supporting service providers (for instance, try to get bank financing or insurance for a rooftop solar system in Ontario right now). In fact, the more radical your innovation is, the greater the resistance is. In the face of this resistance, many cash-strapped entrepreneurs are unable to move their idea to product and from there to a business. When Dr. John Evans and his twelve co-founders incorporated MaRS as a non-profit in May of 2000, the intention was to help entrepreneurs commercialize their ideas and, in the bigger picture, help Canada transition to an innovation economy. Dr. Evans has been the chairman of MaRS ever since and the example below serves to illustrate some of his thinking on how to foster a culture of entrepreneurship. Last year, MaRS staff enjoyed a visit from Dr. Angela Dumas, a consultant and former professor of Design Management at London Business School. Dr. Dumas uses art and creative techniques to facilitate problem solving and as catalyst for new ideas in business. As an example of how she utilizes art, Dr. Dumas asked MaRS staff in attendance to consider three different paintings and choose the one that most resembled the MaRS organization. From a selection of paintings by modern artists such as Pablo Picasso, Piet Mondrian and Wassily Kandinsky, Dr. Evans chose the painting by Kandinsky as the one most representing his vision of the MaRS organization. As opposed to the highly structured Mondrian painting and the surreal but disciplined cubist painting from Picasso, Dr. Evans explained that he selected Kandinsky – whose abstract paintings and theories were a source of inspiration to the surrealists – because the lack of apparent organization in the composition offered individuals and ideas the best opportunity to develop and grow. Admittedly, it would be hard to immediately recognize the influence of Wassily Kandinsky when you enter the MaRS organization. However, entrepreneurs who come to MaRS for assistance and meet advisors such as Charles Plant, Krista Jones, Veronika Litinski and Peter Evans quickly come to appreciate their openness to new ideas and the environment that MaRS offers entrepreneurs and their ideas to develop and grow. environment that Dr. Evans sought to build when MaRS was founded. re of entrepreneurship in Ontario and Canada. 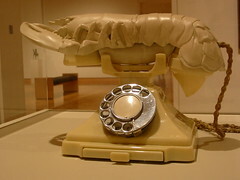 The Surreal Things exhibition runs at the AGO from May 9th to August 30, 2009.